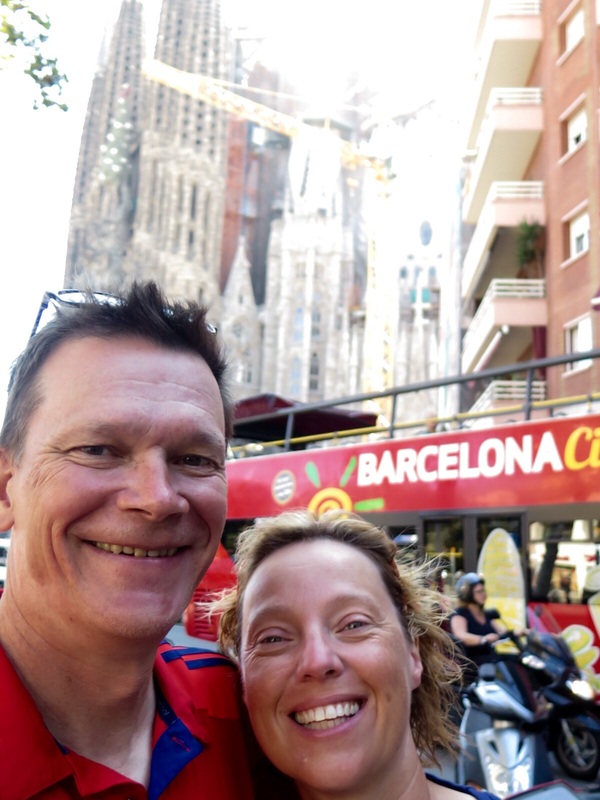 starting today`s last stage from Blanes to Barcelona we were as exited as we have been when we started the Tour back in Bonn… It is something really special to come close to a goal which you have approached for almost four weeks. The leg did use the N-II from beginning to end following the sea. As we shared the road with cars we were a little nervous if it would be a nice final stage or not. But we actually found out that there were more cyclists on the road than cars. 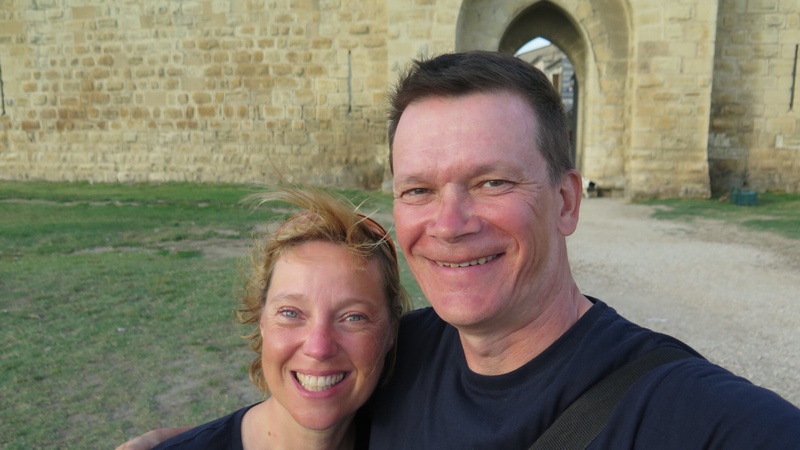 Many of them greeted and cheered when seeing us – Olli and I just could not stop smiling! One of the cyclist on a racing bike joined us for some 10 kilometers and chatted with us. It was an honour for him, he said, to have shared a few kilometers of route with people who had done this kind of journey. One day he would love to do the same. 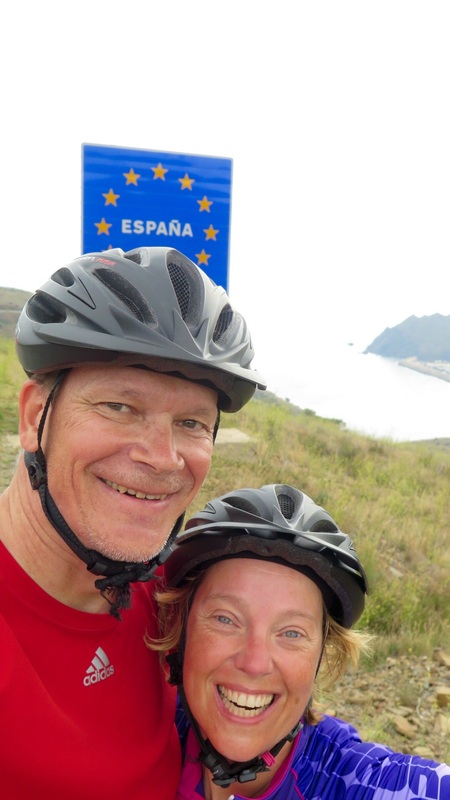 I remember that we have once said the same when our friend Lars told us about his Bonn-Barcelona bicycletour… (thank you so much Lars! We will both never forget that!) It is simply wonderful to be able to make a dream come true! Leg 22, 23 & 24: Mountains! 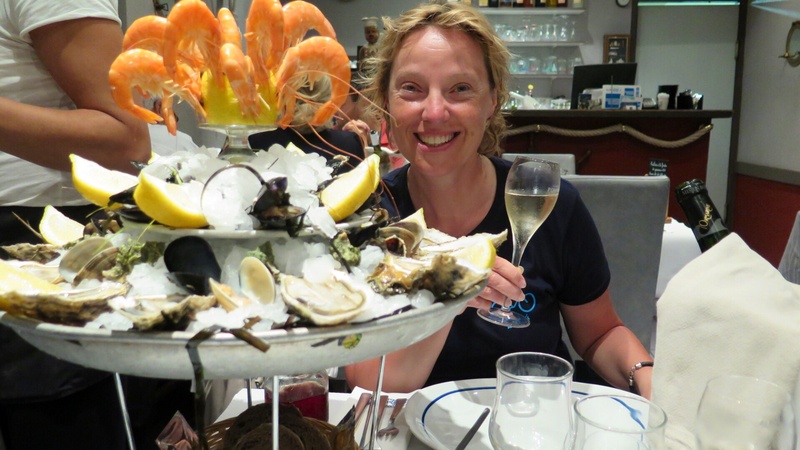 leg 21 finished in Argeles sur Mer with a lovely dinner and in the morning we had a great breakfast and like pseudo-athletes we ate as many scrambled eggs as we posssibly could to prepare ourselves for the mountains. 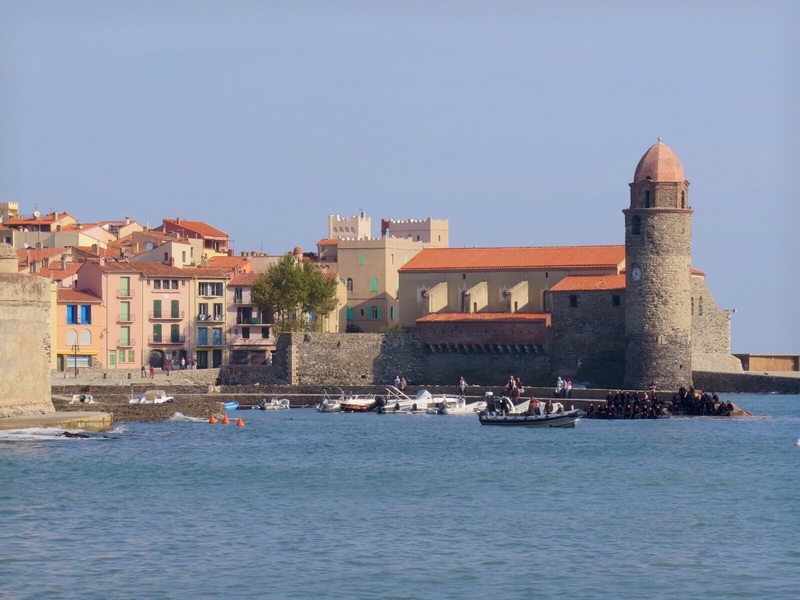 The first steep uphills were not far away and up we went and after that down until we reached the sea again in the gorgeous Collioure. After a short break dedicated to photos (Claudia) and navigation checks (Olli) we continued in the best of moods. The stretch we had just completed would have been one which I would not have been able to do only four weeks ago without pushing the bike. Now we both happily roamed across the hills. And so it went on all day: Up and down in an impressively steep manner. The landscape was spectacular and I really did not expect to hear myself saying that: It was an unbelievably beautiful bicycle day! On one of the highest points of our journey we entered Spain. After some 1700 kilometers cycling from Bonn. 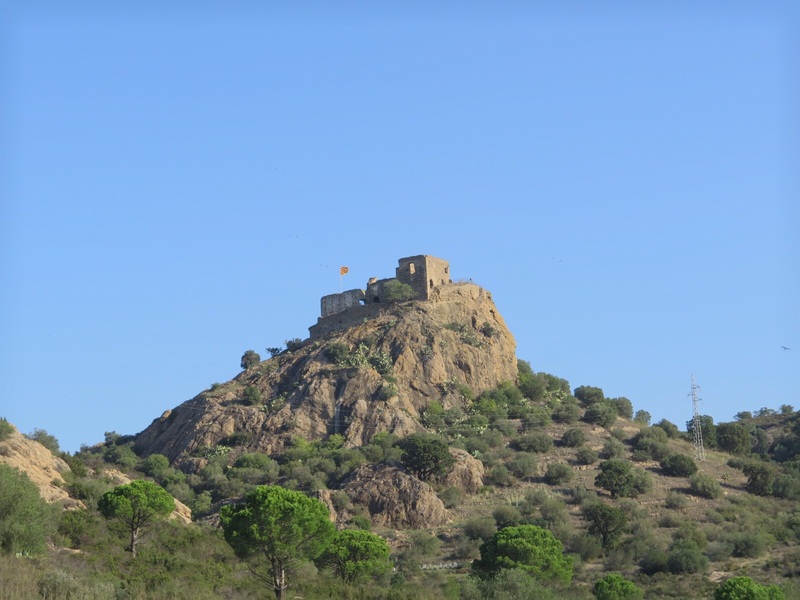 To reach Llança, our destination for the day there were another 20 kilometers of hills to do, but we were over the moon what a wonderful day we were experiencing! If anyone ever visits Llança please do not forget to go to the restaurant Fornall Mari. It is an excellent little place with caring and knowledgeable service and brilliant food – a real highlight. From Llança we started stage 23 to Palamos – overrall a rather flat stage compared to the day before. Well… it started actually with a last steep climb of which ended the Pyrenees for us. Then there was flatness…! In Castello Empuria we had a brief stop to admire the mediaval village centre and the church before we continued our journey. Our route joined the Pirinexus ever so often which runs through the Pyrenees away from cars and other traffic. Whenever we met it though the route was in really bad condition and it became our hobby to actually try to avoid this bikeroute which has been awarded the bicycle route of the year 2014! 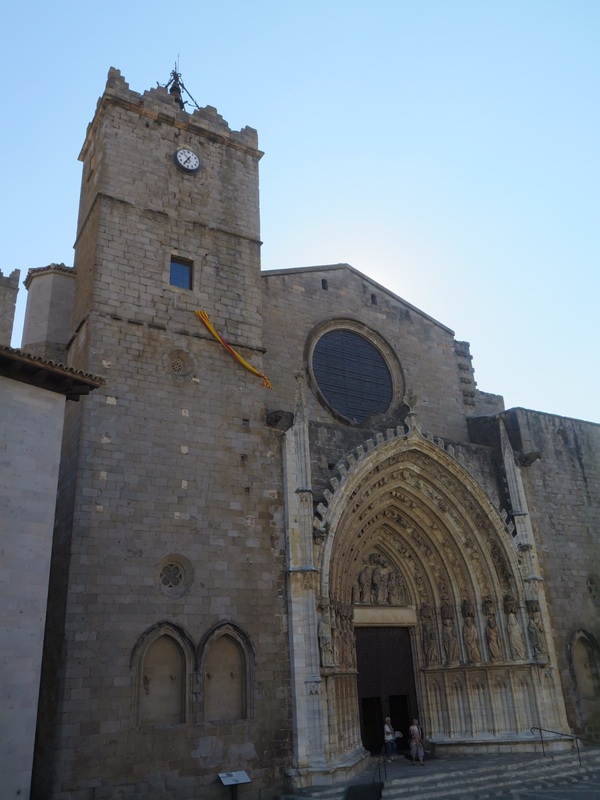 With Palamos we eventually reached that part of Costa Brava where mass-tourism feels at home. Looking from the positive side on it mass-tourism means that you easily find a place to stay in off-season and restaurants are prepared to feed you at times no local would ever think about eating (in Spain: between 5 and 7 pm … at that time we are just freshly showered and a bit rested and REALLY hungry…). Therefore… no complaints – it all has its own advantages! Palamos was the starting point for our leg 24 and there we went further south and approached the second hill-stage. While Olli seemed to hardly sweat I had a hard time on this leg. 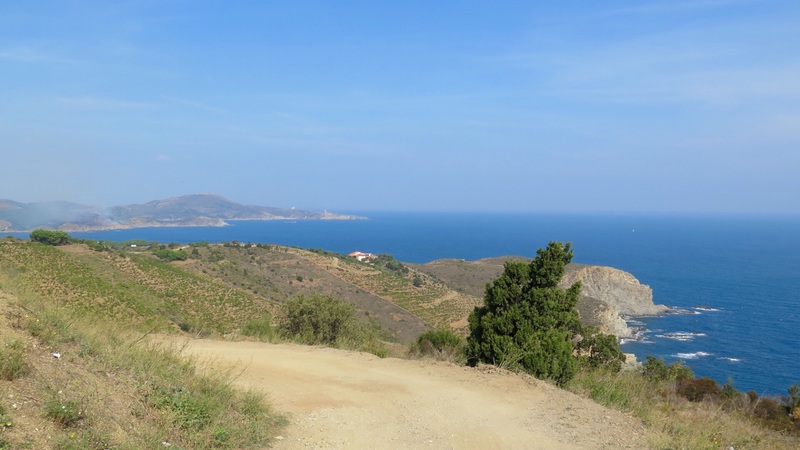 We had to do more breaks to get over the Costa Brava hills – and yes… there is a very good reason to call it Costa Brava. It is a very wild coast! We met a Swiss lady on her bike tour as well – Maja. 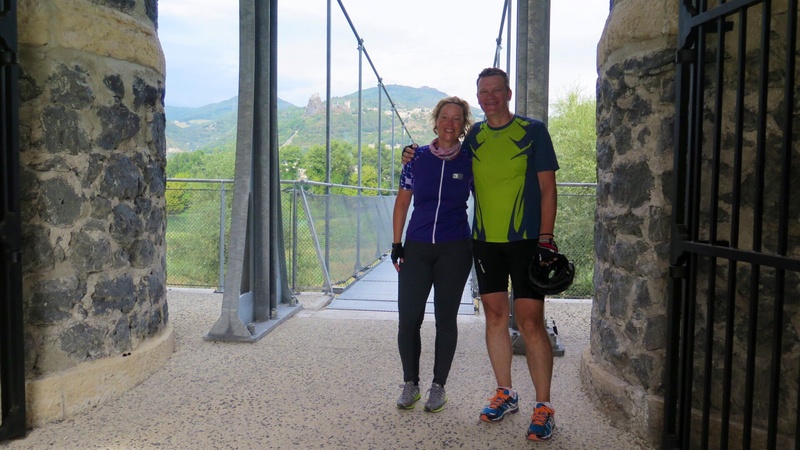 She has just become a pensionist and decided to take on her bike and cycle to Malaga from Zürich. Impressive. Despite of tired legs it was a great day again – over and over we were rewarded with excellent vistas after a climb. 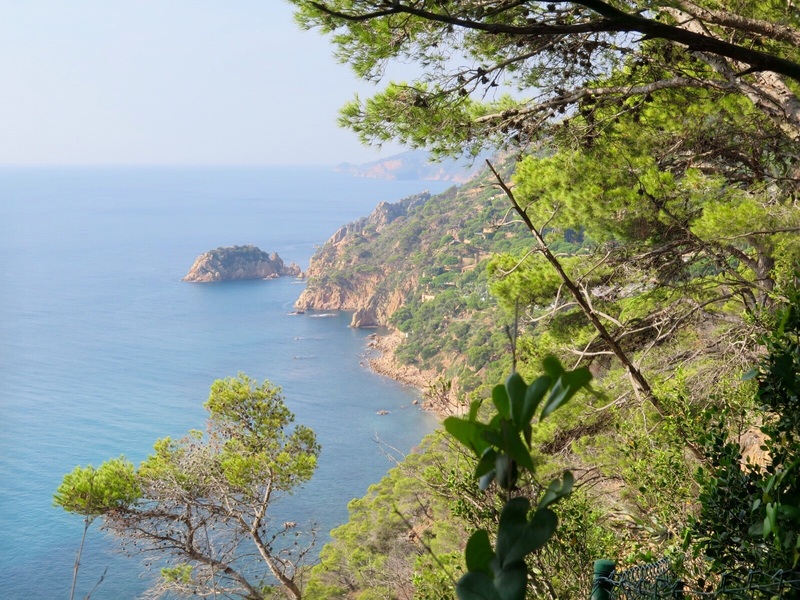 The stretch between Sant Feliu de Grixols and Tossa de Mar is known as well as the “Road of the Year”: 365 curves each presenting impressive vistas! Today`s destination is Blanes and tomorrow it will be Barcelona! our last 2 stages have presented the South of France in all its beauty. 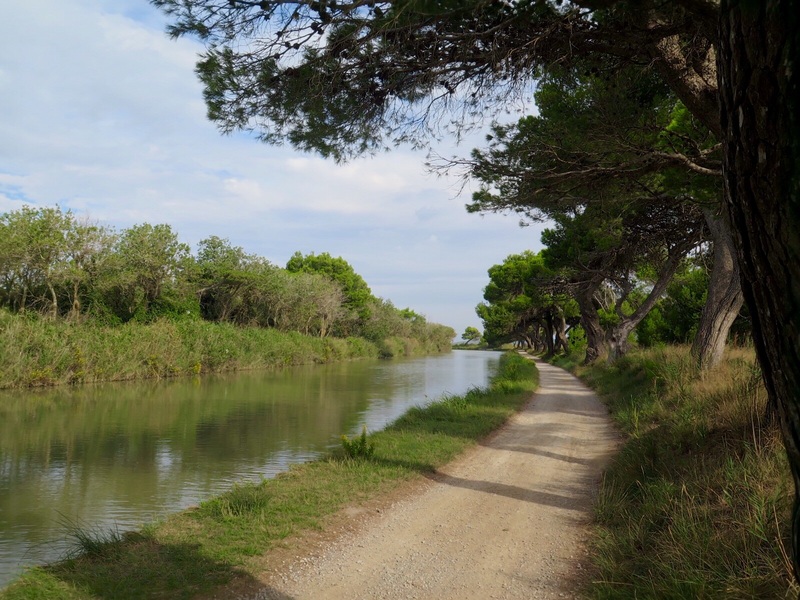 We have enormously enjoyed the cycling which might mean as well that we eventually got used to the sometimes slightly imperfect road surfaces (if there is a surface to speak of) and that we have to stop rather a lot now to double check the route. In addition to the map we keep looking into an offline-App for French cycling routes and Google-Maps to keep us on track. Leg 20 went from Sete to Gruissan. 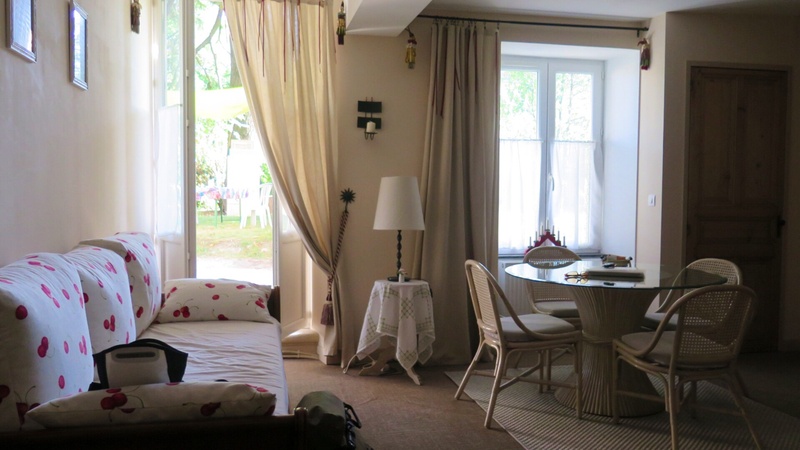 A lovely, peaceful stage which allowed us to get over the pain of leaving Chez Francois…. Gruissan is a pretty and charming little town. I fell hopelessly in love with its surrrounding landscape (direction Port la Nouvelle) which we crossed on the morning of stage 21. 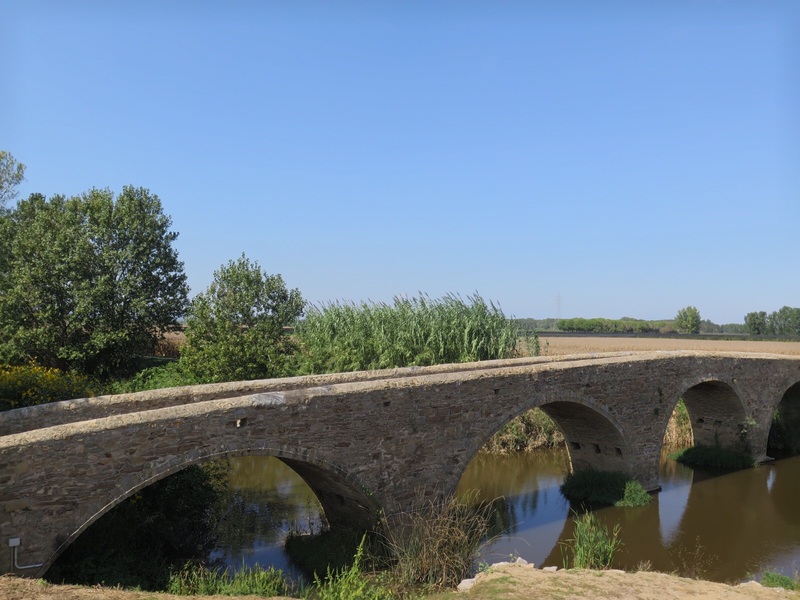 On the horizon the Pyrenees, the marshes and brilliant cycling roads – what an indulgance! I did not want to leave. Behind Port la Nouvelle we found ourselves in a road closure: they were filming for a movie. The friendly security guard asked us to be fast to do the closed strech. “Well” he said when looking at the bikes and the full panniers “as fast as you can…” And so it came that we had the street we thought might be the busiest of our leg all to ourselves. All day the Pyrenees came closer bit by bit and and reminded us that tomorrow we will have the first of our two mountain stages. We will try to cross them with as little inclination as possible following the coast – we will see how that will feel in real live. But as our legs have improved a lot by now the feeling of panic when thinking about the Pyrenees has vanished. What we feel now is respect – which seems adequate, somehow. It will work out somehow! 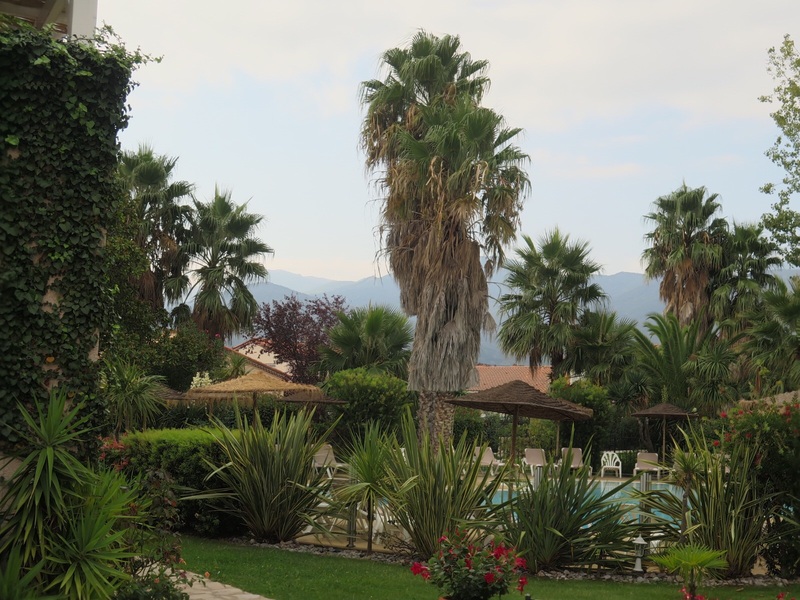 So tomorrow we will be in Catalunya and this is the last blog from France from this journey. So it is Au revoir from us from here and it will chant Benvinguts fromCatalunya tomorrow! We saw this group of pink flamingos near Sete – beautiful! On arrival in Lapalud we escaped intense and nightlong rain with thunder and lightning only marginally. It started raining big drops when we saved ourselves into the Chambre d`Hote and got worse from that moment on. Luckily we had reserved the dinner option in the farm house and oh boy how well we ate again (www.ferme-terrebioprovence.com)! We sat with 3 couples at the table – one English but living in Switzerland for about 30 years, one from France and us. After a while we realised that the common language amongst all of us was actually German. The English couple both spoke good German and the French gentleman mastered the language impeccably as he came from Alsace where they speak German a lot (his wife understood everything but spoke less) and Olli had the chance to practise as well. It was perfect and the evening turned out to be a lovely experience. We were frightened to death looking at the weather forecast for the next 2 days which predicted severe weather in the region we wanted to cycle through. And indeed Montpellier which we wanted to pass by on stage 19 suffered from heavy floodings after that particular night. Still, we were lucky. We did have 2 beautiful and sunny bike days – the weather actually turned out to be that well that I ended up with a sunburn on my arms – not bad for bad weather days! 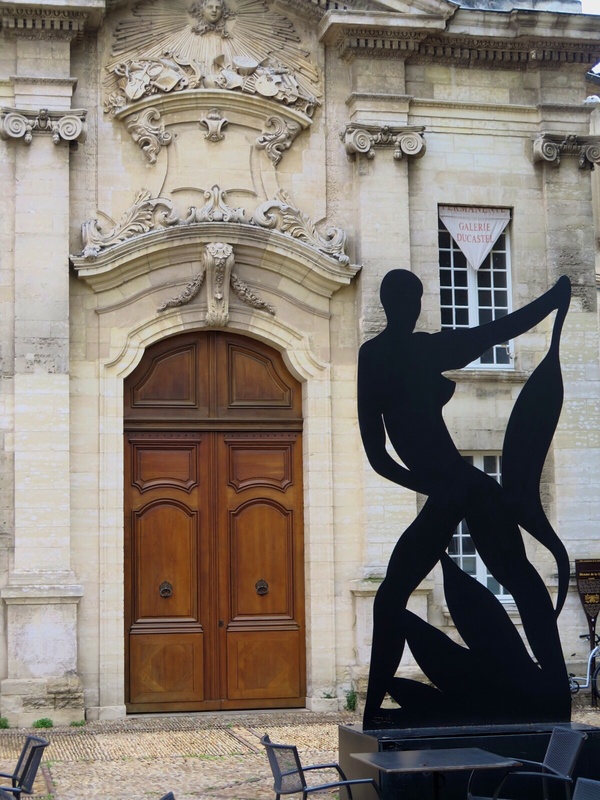 Stage 17 led us from Lapalud to Aigues-Mortes. While we anxiously kept watching the sky everything stayed wonderful and we enjoyed the vistas and the terrific and peaceful route. Lunch we took in Avignon with its gorgeous old walls (Avignon has been papal seat during one of the more “dynamic” eras of Christian history around 1400) – before we continued with slightly overfilled but happy bellies towards Theziers. One of the challenges of the leg was that it was impossible to get the distance between Lapalud and Avignon right – what we had found as information was 35 kilometers but we actually had 60 on the clock when we arrived – slightly disturbing for the planning I have to say… The second stretch luckily was as expected and we reached our destination after a total of 80km. 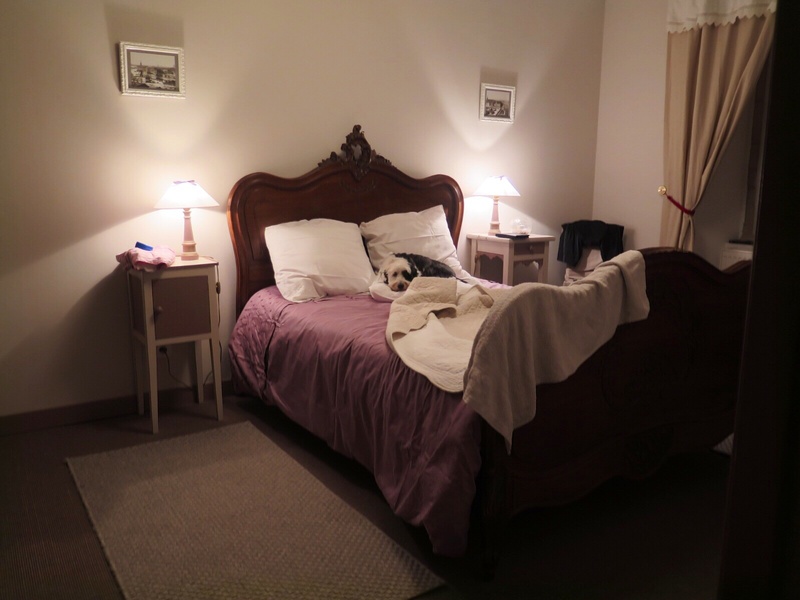 This time we stayed in a vineyard which offered rooms and to Olli`s utmost pleasure a sauna. We hardly cared that we had to hike down into the village to find ourselves something to eat due to that. 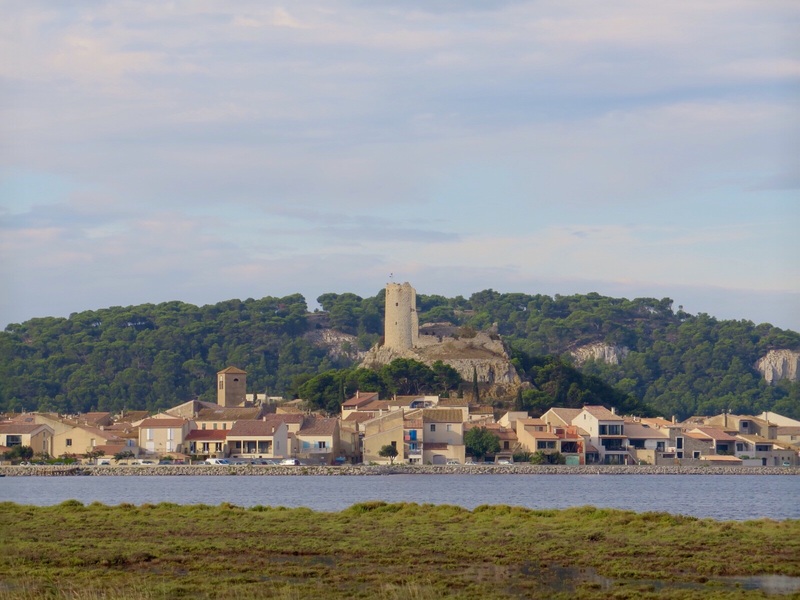 From Theziers we turned towards Aigues-Mortes and again the forecast threatened us with nightmarish prediction. Which again turned out to be wrong – good for us! 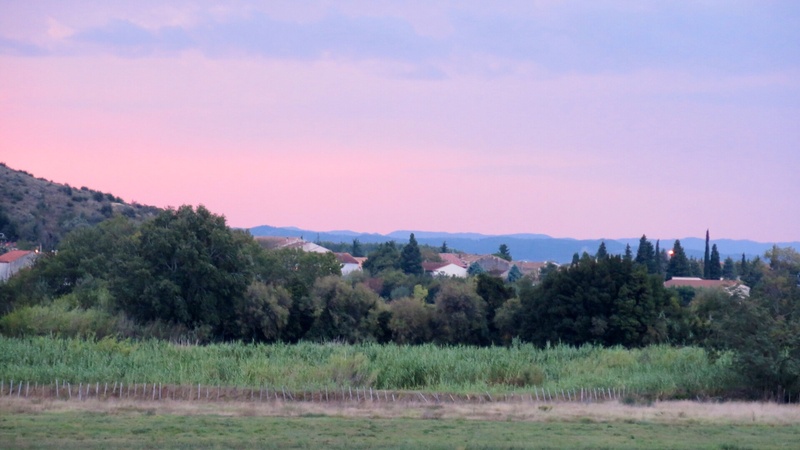 We noticed more and more horse stables and bull farms which we had not seen before on our trip and yes – we actually had entered the Camargue! During this stage we intensified the discussion on the term “flat”. Well, for me flat landscape signifies that I can move forward without experiencing significant elevation change. I got the impression that that was not the case as I had to change in very small gears to labour myself up the hills and shot down on the other side. NOT flat…! Haha, Olli said to that, all wrong – compared to Pyrenees this is flat. 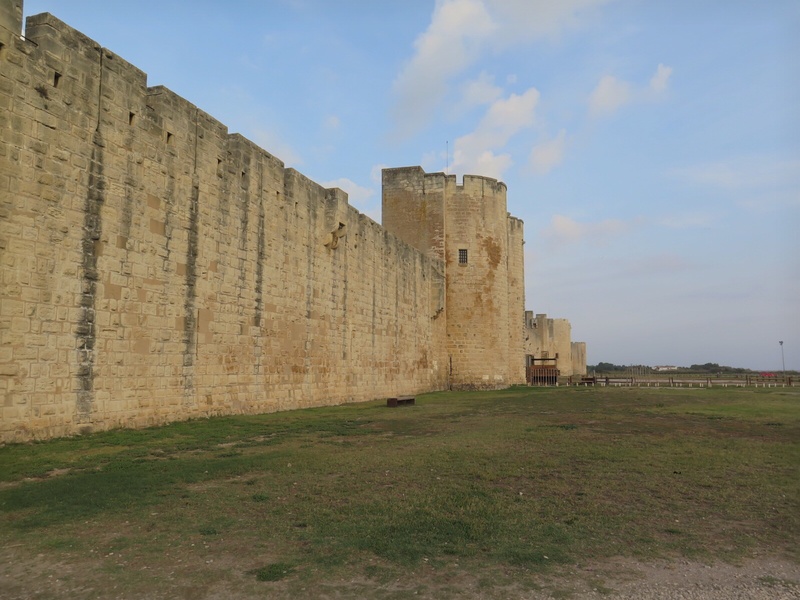 Aigues-Mortes was a really delightful experience. The city has been the starting point of the 7th crusade in the 13th century and still has a complete mediaval city wall and a lovely ambience in its narrow streets. We had an excellent dinner in “Le Dit Vin” and Olli found a little pearl in an oyster. It will join our tour from now on :-). So we went to bed in a very happy state sure that the leg to Sete and the sea would be an nice and easy stroll. Guess we have been there before that things were not exactly as expected, weren`t we? The 55 kilometers of the leg were indeed flat and the wind was either with us or it was windstill – so ideal for an easy day cycling. But no! The stage was the most challenging one we have done so far. 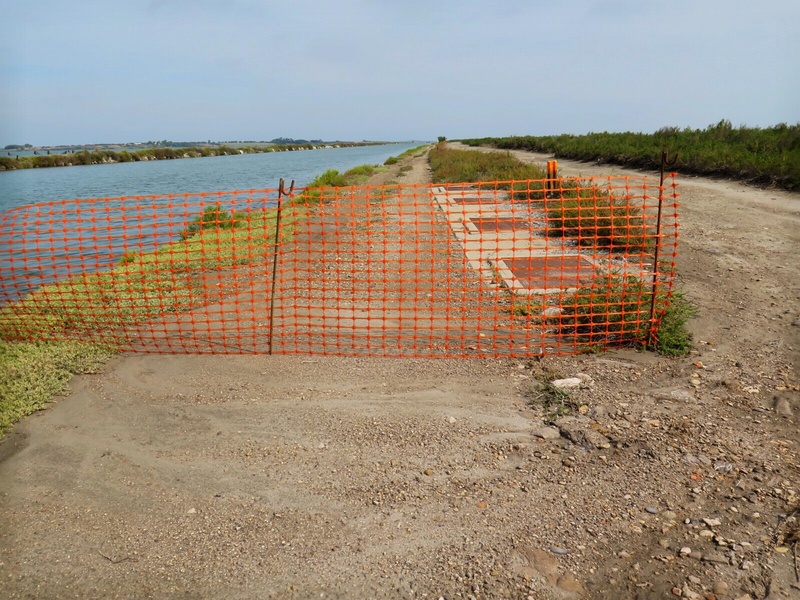 Right after leaving Aigues-Mortes the bike road changed from gravel to a dirt track and then into a construction site for a road. The deep and rain soaked sand slowed us down a lot and made the stretch very demanding. After we had overcome that part of the route we were on a normal road with cars which converted into a highway. It was clearly faster to cycle now but pretty stressful… And as we were at it we had the dirt track/road construction and then highway combination another time a bit later on. After 50 km we were completely done. 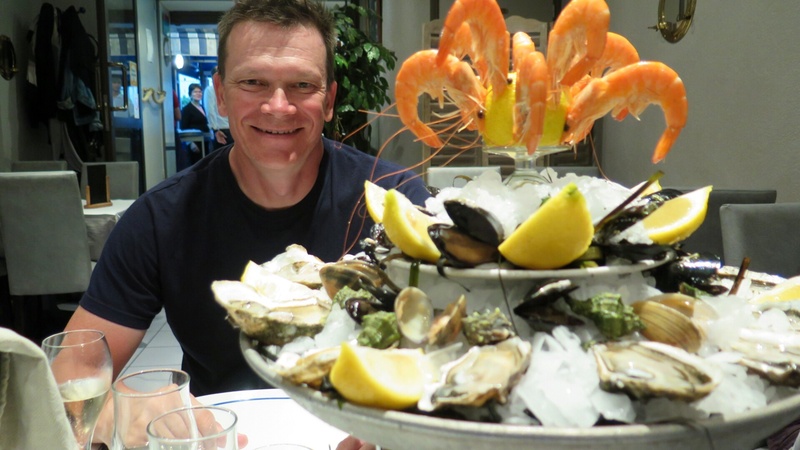 But: we are in Sete and did pay our visit as planned to “Chez Francois” where we will eat lovely sea food tonight as well. And Sunday is our rest day – a treat after a cycling distance of 1,551 kilometers since Bonn. And that is Bye Bye from us again: Bye Bye! Today`s leg led us from Le Pouzin to Lapalud – thanks to our lovely host in Le Pouzin, Dominic, we had a really gorgeous stage. As we have mentioned in an earlier post we sometimes have a bit of a challenge to identify the route of ViaRhona and this was the case in Le Pouzin as well. A little drawn back from the traffic on the main street which we understood would lead us to ViaRhona for many kilometers, we decided to go an alternative route all together and use the opposite side of the Rhone. When Dominic (who does not speak any English but was very helpful and patient communication with us nonetheless) asked us which route we had planned for the day he was not happy with our idea. “No, no, no – not a good idea! Too much traffic on the other side of the river. Why would we not simply follow the street we were in, take the tunnel under the railway and then left and Voilá: we would be on ViaRhona!” Olli, who is in charge of planning the stages gave it a very brief thought and off we went following Dominic`s description – and that was the right decision for sure. Our favourite bridge on the other hand was the rope bridge! 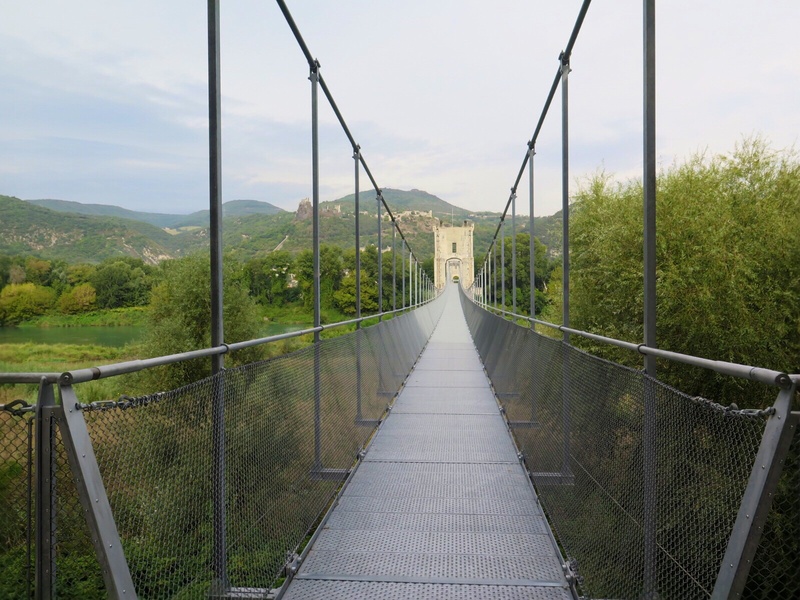 No – you did not mis-read: I mean it – ROPE BRIDGE!! 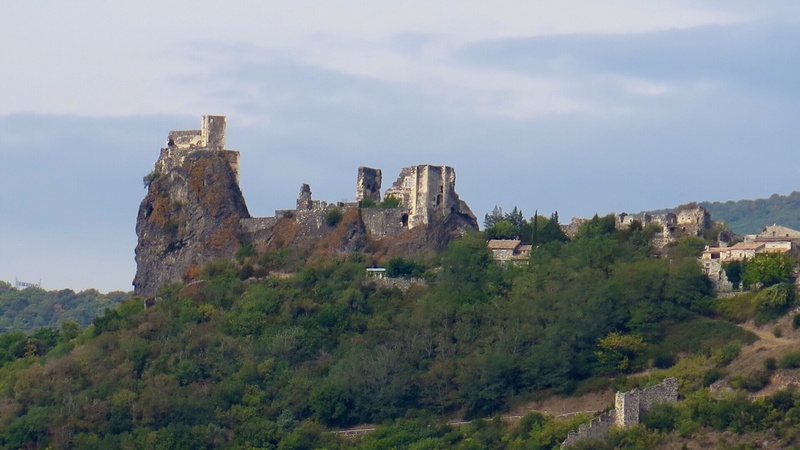 We already were over the moon when we saw Chateau Rochemaure which started to spread out across the hill. Despite of slightly falling apart the castle is remarkable and impresses both by its location on top of bare rocks and its size. But when we turned our back to the castle we found ourselves in front of a really old little bridge – and on this bridge no car would fit! In between the century old bridge piers a rope bridge made of steel had been installed for bicycles and pedestrians – ingenius! It is an amazing experience to cross the bridge. You pass the stone pier and feel you cycle into… nothing… Below you are light metall plates and left and right there are steel meshes with a steel rope as handle on top. And then you let go and the bike rolles on, while you concentrate on the next pier in a somehow perplex state of mind before approaching the final pier at the other end. Some 200 meters of the most phantastic marriage of old and modern architecture. This bridge is worth a visit! We have been delighted as well about peoples’ friendliness in this region. We have been asked twice if we were lost and offered help in the most patient way possible – simply lovely! And I admit that I enjoy it when we are greeted with enthusiasm by fellow cyclists. While the “Bon Jour” in Alsace and Franche-Comte is rather aspirated it will be belt out in this region – very nice!! The upcoming (head-) wind then announced that the weather forecast (we use: http://www.yr.no – the best ones we have found) was unfortunately very accurate and a massive rain front was closing up on us. So we cycled as fast as possible and managed to reach the Gite (french for Bed & Breakfast) with the first drops of rain and thunder. This night we stay and dine on a bio-farm, which again is located in a beautiful old farmhouse which has been renovated with an obvious love for detail. [www.ferme-terrebioprovence.com]. So it’s Bye Bye from us for now – Bye Bye! Leg 14 & 15: Eventually… the South! it is a bit tricky to describe these two legs… Reason being that it would be best to completely forget about the 100 kilometers between Macon and some 30km south of Lyon. It was simply not nice and was not made any better by trying somehow to find a way to leave Lyon… The mentioned 30 kilometers were marked by us not being able to find any kind of bicycle path and we were with bikes and panniers in the middle of heavy traffic, surrounded by cars and lorries until we accidentally found the “Via Rhona”. 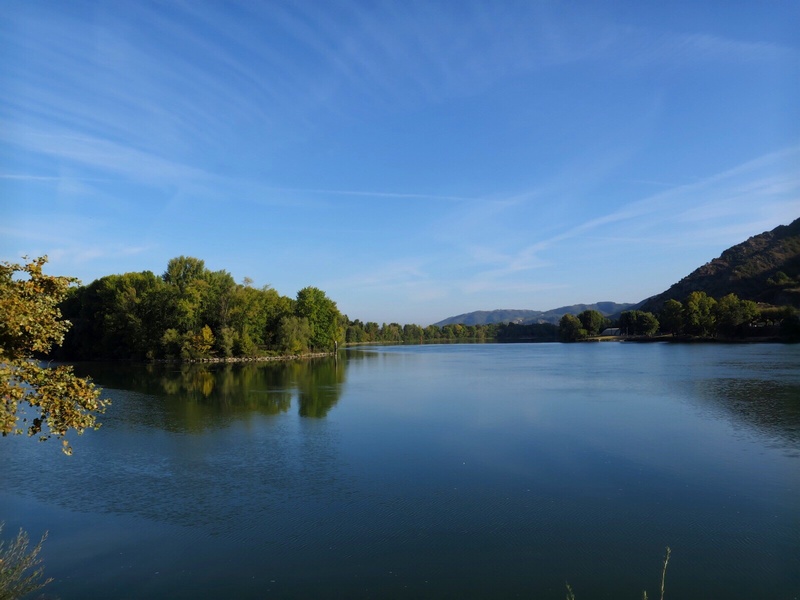 That is the bike route which shall lead us first to the river Rhone and following it towards the Mediterranean Sea. Well, let`s say that Via Rhona is nothing for people with weak nerves. 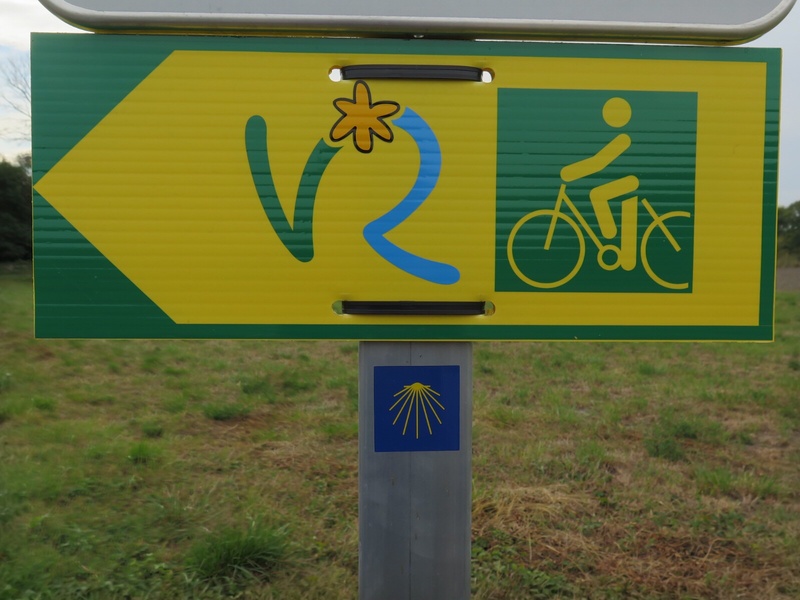 What we have found so far was: Missing sign posts, perfect indication of the route, paths that were hardly possible to cycle and brilliant surfaces. To keep things entertaining they change in random order 🙂 The second half of the stage eventually made up for it and became more and more beautiful. 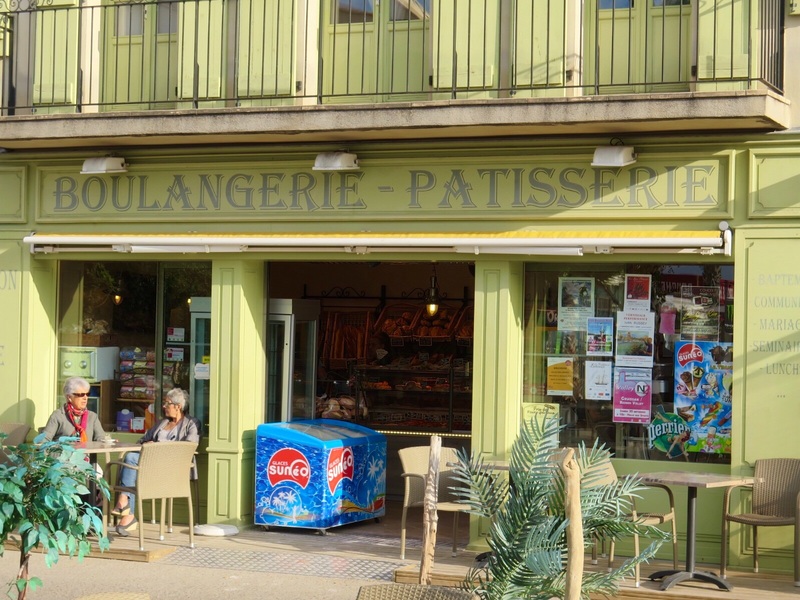 Even people we met were a lot more friendly than around Lyon (where I admit they appeared to be rather grumpy – no offense…) – and our mood rose! Today`s leg was rather short with 65km and absolutely gorgeous: The landscape became more “southern” (as Olli said: Look, the grass is looking burnt from the sun!! 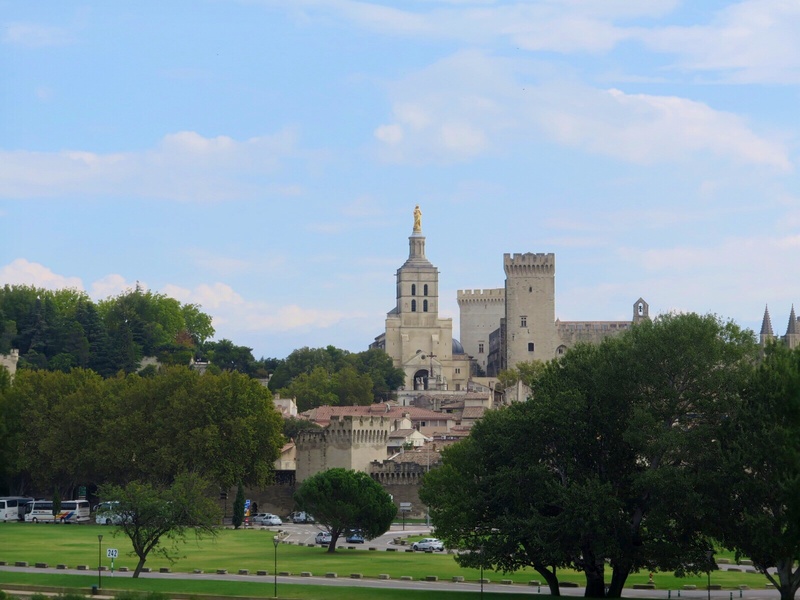 ), Valence is beautiful and rewarded the visit with a wonderful lunch – and we enjoyed the rest of the day to Le Pouzin fully. Even the headwind did not bother us too much – we have been very lucky so far with backwind that it almost feels right to have a bit of a headwind now. Tomorrow we will go towards Orange – we get ever closer to the Sea! So it`s Bye Bye from us for now… Bye Bye!